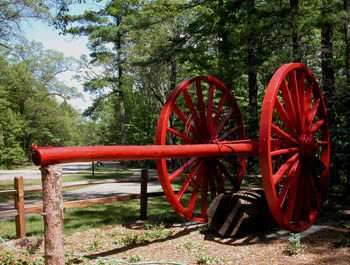 One of the first things most visitors notice in Interlochen State Park is the well-preserved "Big Wheel," the device the loggers used to haul timber out of the woods at the turn of the century. It's a bit ironic, of course. Interlochen was one of the first state parks preserved because loggers and their big wheels had passed it over. The 200-acres of virgin white pine that somehow escaped the lumbermen's axes were preserved as Michigan's second unit in 1917 by the state legislature, which paid $60,000 for the land, the price of timber on it. Although its trees were spared, there was a large sawmill located near Interlochen's northern campground that produced barrels from logs that were floated across Duck Lake. Today the 200-acre park is probably best known, not as one of the few remaining stands of virgin pine, but as the park next to renowned Interlochen National Music Camp, which was established next door in 1928. The state park might be the only place in Michigan where you can bed down to Bach or Beethoven. Interlochen is actually the thin strip between Duck and Green lakes and features almost a mile of lakeshore along with its towering pines. Unfortunately trails are limited at Interlochen. The park features only the Pines Nature Trail, a 0.6 mile-long loop that winds through a woodlot that includes the few remaining large white pine. The interpretive path is short but for those camped at the large Duck Lake campground it can be a quite reprieve from the busy facility during the summer. The loop is followed in a counter-clockwise direction and the most dominate trees are seen between post No. 4 and post No. 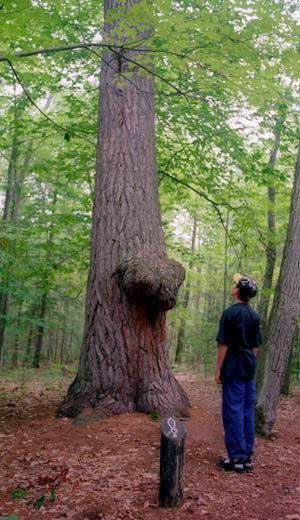 8, which marks the largeest white pine that stands at more than 100 feet in height. Subjects range from tree identification and wildlife evidence to the remains of a railroad bed from the Manistee and Northeastern Railroad that once had a small station within the park. Pines Nature Trail is crisscrossed by many unofficial paths and even a power line but the route is very well marked and easy to follow, even for kids. With a total of 476 sites split between two lakeside campgrounds, Interlochen offers more sites than any other unit in the state park system. 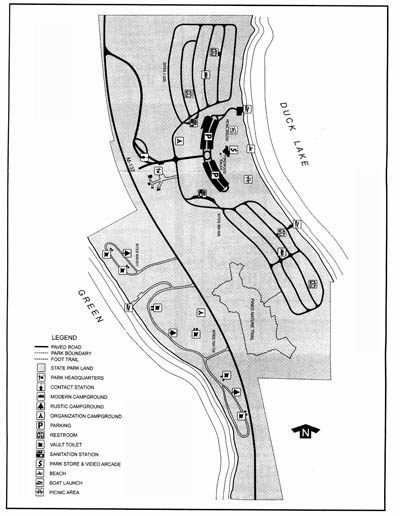 A campground along Duck Lake features 418 modern sites along two loops on each side of the day-use area. The area is well shaded by white pine, and many sites are located along a steep bank overlooking the lake. Along Green Lake is a rustic campground with 58 sites. Many of them have a good view of the lake from the heavily forested shoreline. The park also has a Rent-A-Tent program in its modern campground along with two Mini-cabins. Interlochen also maintains a day-use area on Duck Lake that features a wide, sandy beach, designated swimming area and picnic shelter that can be rented. Surrounding the beach is a wooded picnic area and parking for 200 vehicles. A boat rental concession has rowboats on both Duck Lake and Green Lake and is open daily from Memorial Day to Labor Day. There are boat launches on both Duck Lake and Green Lake. Interlochen is located 15 miles southwest of Traverse City. The park's entrance is on M-137, 3 miles south of US-31. Contact Interlochen State Park (231-276-9511). 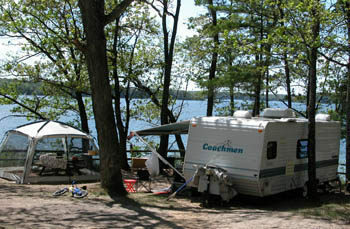 To reserve a campsite contact Michigan State Park Central Reservations (800-447-2757; www.midnrreservations.com).